Words that are in BOLD face shows that it's an item. Words that are UNDERLINED shows that it's a location. Pokemon names with normal text color can be found in all versions. Pokemon names with a RUBY color can only be found in Ruby version. Pokemon names with a SAPPHIRE color can only be found in Sapphire version. Pokemon names with an EMERALD color can only be found in Emerald version. Pokemon names with a cannot be found in Emerald version. 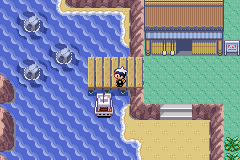 After going through a long and tiring route, you'll finally arrive at Rustboro City. Here, you'll be able to have your first gym battle. But first, we'll explore the city. Once you get into the city, go west and you'll see a huge building. Go inside and up to the second floor, and you'll see a little kid and an old man. Talk to the little kid, and he'll give you a Premier Ball. Near the center of the city, there's a Pokemon School. Go inside, talk to the teacher, and he'll give you Quick Claw. You can also learn some important information from the blackboard. In Emerald, go to the lower right-hand side of the school, and you'll see that mysterious person that talked to you back in Petalburg City. His name is Scott, and he's looking for "Pokemon battle experts". Now for the most important item. There's a house next to the Pokemon Center. Inside, talk to the man, and he'll give you HM01 - Cut, something that's very essential. Teach it to a Pokemon, but remember, it cannot be overwritten (at least for now)! Then, heal your Pokemon, and get ready to rumble, because you're going to the gym! North of the city is the gym. If you chose Torchic as your starter, you might have a hard time in this gym, since this is a rock-type gym. Treecko or Mudkip will do great, but don't expect an easy win. You first need to get through two Youngsters with Geodude before getting to the leader. 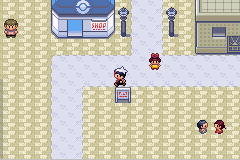 In Emerald, on your second battle, both a Youngster and a Hiker will battle you at the same time. You'll be battling five Geodudes. Heal Pokemon and save game if necessary. It's time to battle the gym leader, Roxanne. She has a lv. 14 Geodude and a lv. 15 Nosepass. In Emerald, she has two lv. 12 Geodude instead of one. The Nosepass is a lot harder to knock out, so be careful! Beat Roxanne and you'll get TM39 - Rock Tomb, and the Stone Badge. It heightens Attack, and now you'll be able to use Cut outside of battle. Get out of the gym, and a person will talk to you. It's about Team M/A. They've stolen his goods. Heal your Pokemon again, and exit the town by going northeast into Route 116. The person will talk to you again. Never mind himp; go on east. You'll go through a ton of trainers and items, not to mention wild Pokemon too. Here, too, a Youngster and Hiker will battle you. From now on, you'll have plenty of these "odd" two-on-two battles. 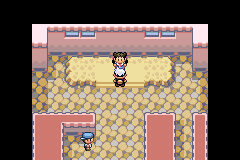 At the end of Route 116 is a cave with an old man and a house with a guy blocking it. Before that, there is a small section of the route with trainers and items inside. Use Cut to get inside. 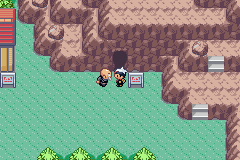 When you try to get into the cave, the old man will talk to you about his Pokemon getting stolen. After that, go inside. The inside of the cave is totally foggy! Go up for an item, then go east, and you'll find a Team M/A member (Aqua in Emerald). Talk to him, and he'll battle you. After winning, you'll receive the goods, also known as the Devon Goods. The old man will come in to take his Wingull away. You won't be able to continue through the cave, since there are boulders blocking your way. Go outside now, and you'll find the guy blocking the house isn't blocking it anymore. You can go in there now, but there won't be anything to do. Go back to Rustboro City now. Before you reach there, the same person who talked to you before will talk to you again. He'll give you a Great Ball, lead you into a building, and lead you to the President of Devon Corporation. The President will talk to you, and will give you the PokeNav, short for Pokemon Navigator. This appears in your Menu, and takes the place of the PokeGear (from previous games). Its main function is the map, and it also does other little things. The President will also give you a Letter to hand to a guy named Steven in Dewford Town. After receiving that, you can leave the building. Before you leave, in Emerald, a scientist will stop you and add a Match Call to your PokeNav. It's basically a cellular phone to communicate with trainers you've met before. Leave the city by going back south through the forest. In Emerald, your rival will first stop you and register herself in your Match Call, and you'll have a choice of battling her. Once you get into the forest, you can cut the two trees to explore the rest of the forest. There is a girl inside the unexplored part. Talk to her and she'll give you Miracle Seed. There are two Itemballs in the unexplored part and a hidden item in an empty spot in the grass. Eventually, you'll reach a small house with a boat floating on the water. Go inside, and you'll find the old man (known as Mr. Briney) and the Wingull you rescued. Talk to him, and he'll take you on his boat to get to Dewford Town.